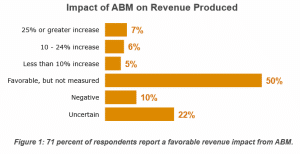 True, new research indicates 82% of ABM programs fail to achieve measurable success. Why is that? How do these deployments differ from the ones that win? No spoiler alerts here… you’ll need to learn the answer in the full context of this free research report. This report is the fruits of our labor, the Account Based Marketing Consortium. Learning from the newest primary research and literally hundreds of actual ABM programs. The top three groups, 18% of all survey respondents, are the only ABM practitioners who are mature enough in their marketing approach to both produce an ROI and be able to measure it. Seriously, grab the research report. It does a great job to unpack the reasons why, rationale how and pathway for other marketers to emulate this success.